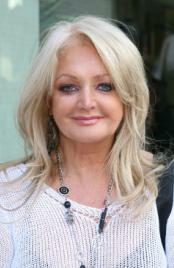 Bonnie Tyler has been a world star since 1976, when she stormed the charts with the infectious 'Lost in France'. She has consistently been one of Britain's top-selling female artists and has twice enjoyed incredible international success. Bonnie was born 'Gaynor Hopkins', in 1951 (not 1953, as many biographies claim!) in the small village of Skewen, outside Swansea, in South Wales. For as long as she can remember music has played a huge part in her life. In fact her earliest memories are those of her older brothers and sisters rolling up the living room carpet and dancing to the pop hits of the day. Also, Elsie Hopkins, Bonnie's mother, is a keen opera fan and distilled in Bonnie a great love of music from an early age. However, her heaviest influences at a young age included the Tamla Mowtown records, Janis Joplin and of course her hero Tina Turner - all of which soulful influences shine through in many of her recordings. Bonnie was refused entry to the school choir (! ), but this didn't deter her from singing into a hairbrush in front of the mirror in her bedroom, dreaming of fame, screaming crowds and her earliest ambition - to appear on 'Top Of The Pops'. In 1969 Bonnie entered a local talent contest singing Mary Hopkins' 'Those Were The Days' - her efforts winning second place and a crisp ? note! Now that she'd had her first taste of limelight there was no stopping her! In July 1973, Bonnie married Robert Sullivan, who at the time managed a night-club in Swansea - incidentally this was where they met while Bonnie was the resident singer. During this time Bonnie assumed the stage name 'Sherene Davis', in fact Robert called her Sherene for two years after they met! Robert had represented England in the Olympic Games at judo a year previously and still retains his black belts in judo today. Bonnie often refers to him as her personal bodyguard. Today he is a millionaire in his own right, owning an empire of business ventures, including real estate companies, a 5,000 acre cashmere farm in New Zealand and Cwmnantlleici Quarry near Pontardawe (one of Wales largest) which produces Blue Penant sandstone used in historic, restorative and private building projects across the country. Robert accompanies Bonnie everywhere and they have been happily married for over 25 years - undoubtedly one of the longest showbiz marriages in Britain. On an ordinary night in 1975, Bonnie (aka Sherene!) was doing her normal cabaret routine in ' The Swansea Townsman Club'. Little did she know that there was a talent scout for the songwriting team of (the late) Ronnie Scott and Steve Wolfe in the audience. He had actually come to listen to the singer performing upstairs, but fate brought him in front of 'Sherene'. Obviously impressed, this scout went straight back to London with news of a brilliant girl singer he'd seen in Wales, and soon after 'Sherene' was asked to go to London a record a demo track.